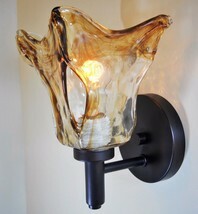 Dark Brown Finish Swirl Art Glass Wall Sconce Vintage Edison Bulb Type Fixture Traditional styling intricately blends with art glass to create this unique, rubbed bronze fixture sure to be noticed by your guests. 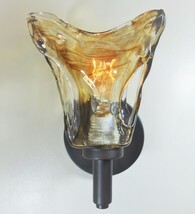 Each one is distinct with its striking hand-blown amber glass and delicately waved edging. Embellished by the amber toned shades and an elegant bronze finish, the soft flowing metalwork gently embraces the original art glass making it a superb piece of artwork. 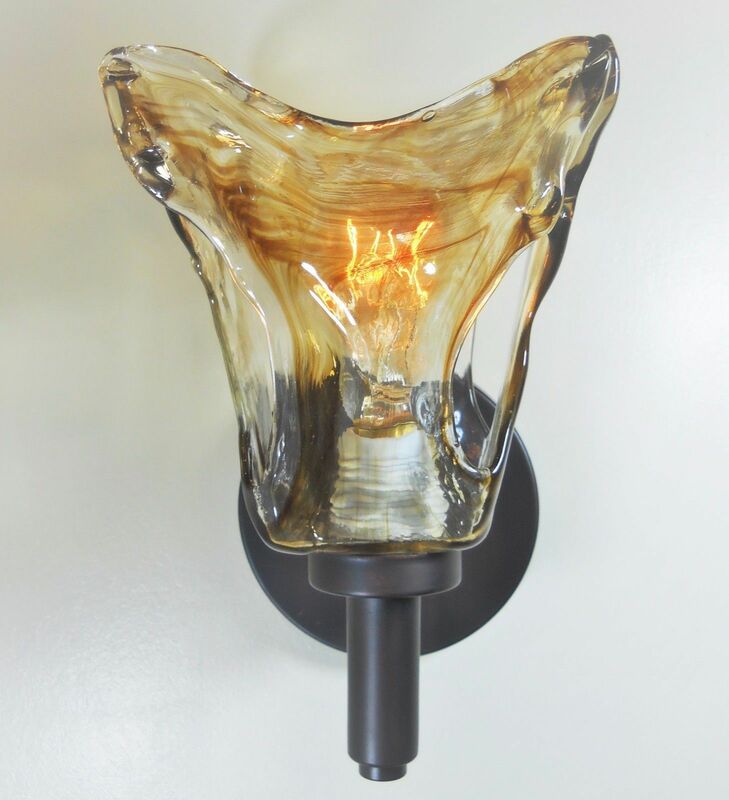 Height: 9 inches Diameter: 4.75 inches Extention: 7 inches 1 standard bulb 60 watt max (not included) Shade color may slightly vary since this is hand blown glass Price is for (1) ONE fixture Please send message if need more items than listed We will only ship within the United States. Shipping will occur from different locations in the United Sates. Most items will ship via FedEx or UPS RETURN POLICY Merchandise must in re-saleable condition, in its original container or box, including all packing material, and any accessories. Merchandise must not have been installed or altered in any way. Each item will be inspected upon return. All returns must be have an RA#, please contact us to start this process (without it, items will not be accepted and no credit will be issued). If packaged was opened, we will deduct 15% as a restocking fee Customer is responsible for any and all shipping fees to return the item(s) ONLY via FedEx, UPS, or DHL which should include tracking. Insure all packages when returning them, any items damaged during the return to us will not be issued credit. DAMAGED AND REPLACEMENT POLICY In spite of our best efforts, occasionally products will sustain damage in transit. We?ll get replacement parts or a replacement fixture to you as soon as possible, free of charge. Please inspect all packages before signing for them. If there is damage to a box please make note of it with UPS, FedEX, DHL etc?If there is no visible damage to the box but the contents are damaged please contact us with a thorough description of the damage and what parts need to be replaced. If we are not allowed to replace an item that is damaged you may be subject to shipping charges for the original order as well as return shipping charges to return the item to us. If we are not able to replace an item, we will ask you to ship the merchandise back free of charge and will refund all original fees to you. We are not responsible for any fees associated with the cost to repair or install of damaged items (please inspect before installing). Please, please do contact us if you are not satisfied in any way... We are here to help. FEEDBACK Your satisfaction is our priority. Please contact us if you feel you are not able to leave a 5 star rating. We will leave positive feedback once we know we have met your expectations!